When you are planning a meeting with people from different cultures maybe you have already prepared by learning about the way people greet each other and other surface cultural differences. But chances are that your meeting might be derailed by some non-obvious cultural misunderstandings. Here are the top three problems I have seen in workshops and coaching people about intercultural business. 1. MEETINGS DON'T ALWAYS HAVE THE SAME SCOPE. This is probably the hardest intercultural issue for most people because they rarely if ever ask themselves what a meeting is for, yet this basic concept is the root of many conflicts. 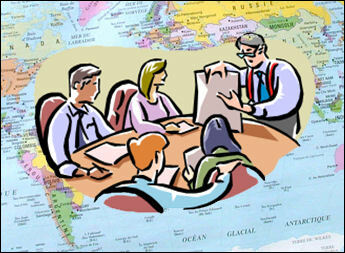 In the USA and some western European countries meetings are usually open forums where new ideas can be discussed -- even ones that have never been raised before -- and decisions are taken that will automatically be implemented later. There are significant variations to this approach in many other countries. In Japan, for example, decision making is by consensus rather than open confrontation so the decision is often taken before the meeting starts and scheduling a meeting can be one way to push for this consensus to be reached. Even within Europe expect significant differences, so that in Germany you would often be expected to submit written documents in advance and then discuss the documents in the meeting: free brainstorming would not be the norm. There is no way to make a complete list of the different approaches and there are also variations in organizational culture so the only way to be sure what a meeting is for is to discuss this with the other people either in advance or at the start of the meeting. Many people will be surprised that this is needed but be very pleased to have clarified the issue before the discussion starts. 2. BAD NEWS IS NOT ALWAYS SHARED IN OPEN SESSION. In cultures where people are "direct" communicators -- USA, Netherlands, Nordic countries -- it is very common for people to present bad news in front of everyone in an open meeting. Most cultures, though, favor "indirect" communication where it would be impolite to give bad news in front of other people to avoid loss of "face". In these cultures you would give negative information in one-to-one contacts during breaks, at lunch or dinner. For the same reason you would not openly contradict what another person has said or even correct an obvious error. Indirect communication is very common in societies with a strong sense of hierarchy, which is actually the majority of cultures on this planet. To deal with this problem the simplest way is to talk privately with someone else familiar with the culture of the meeting to find out how things are likely to be done. 3. A CLOSED ITEM DOES NOT NECESSARILY STAY CLOSED. Many people in the west follow a "sequential" style of meeting where decisions are broken down into smaller steps and each step is discussed and then decided -- the item is then said to be "closed". The understanding in the USA and a few other countries is that the closed item will not be discussed again and that what was decided will be done. In other cultures both of these assumptions can be wrong. Even within Europe you will encounter cultures where a closed item will suddenly be reopened later in the meeting, or perhaps even after the meeting. Where there is a very strong sense of hierarchy a decision reached in a meeting might be overturned later by someone more senior or simply following an informal meeting in a corridor. Because of these deep and unexpected cultural differences, meetings between people of different cultures can be very frustrating and sometimes unproductive. It is impossible to list all of the possible variations in regional, organizational, professional and generational culture that can impact the way a meeting will work. When you are meeting a group of people all from the same culture the best plan is to ask someone with local knowledge how things are expected to work. In the more common case where there is a multicultural team you need to agree on a common approach: before the meeting starts or before a new team starts to work together it is a good idea to first agree what sort of meeting you are going to have. Though once again you need to reflect on whether it is better to discuss this privately with people before the meeting or as the first item on the meeting agenda. Ask an expert for help if you are not sure which is the best way in your case. Culture, Innovation and the Curious Case of Pandora Radio. Lectures, Workshops, Coaching on intercultural issues. All of these articles are based on lectures, workshops and webinars on intercultural communication and management created by the author. For more information about these visit andrewhennigan.com contact me by mail at speaker@andrewhennigan.com or call 0046 730 894 475.